Harvard Club Brownbagger — What's Up with Energy and Technology in Hawaii? Bring your guests and join us Wednesday, Nov. 14th as our old friend Jay Fidell takes us through some of the more remarkable and fascinating aspects of the energy and tech scenes in Hawaii, now and in the future. Jay is a graduate of Queens College of the City University of New York and NYU Law School, where he took an LLB (JD) in 1965 and an LLM in Taxation in 1971. He came to Hawai‘i in 1965 as a Coast Guard lawyer. He practiced with Wooddell, Mukai, Wirtz, Ichiki & Whitfield from 1971 to 1974, and then became a founder of the firm known as Bendet Fidell Sugimura. He practiced business law there until 2012, when he retired after 40 years of active practice. Jay founded ThinkTech Hawai‘i in 2000. He has served as a director of HTDC, NELHA, HSDC, HSTC, HVCA and the Hawai‘i Energy Policy Forum. 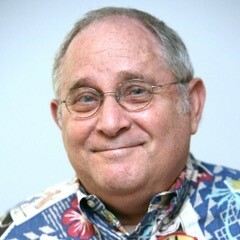 He produced a weekly ThinkTech radio show on HPR until 2008. He wrote for the Honolulu Advertiser and Star-Advertiser from 2008 to 2016. As CEO of ThinkTech, he produces some 35 streaming video talk shows a week and a feature show on OC16, and believes in citizen journalism, especially now. He is an ardent advocate for technology, energy, economic diversification and global awareness in Hawaii.